1. Direct Support Professionals make it possible for many individuals with intellectual and developmental disabilities to lead full lives in their communities. 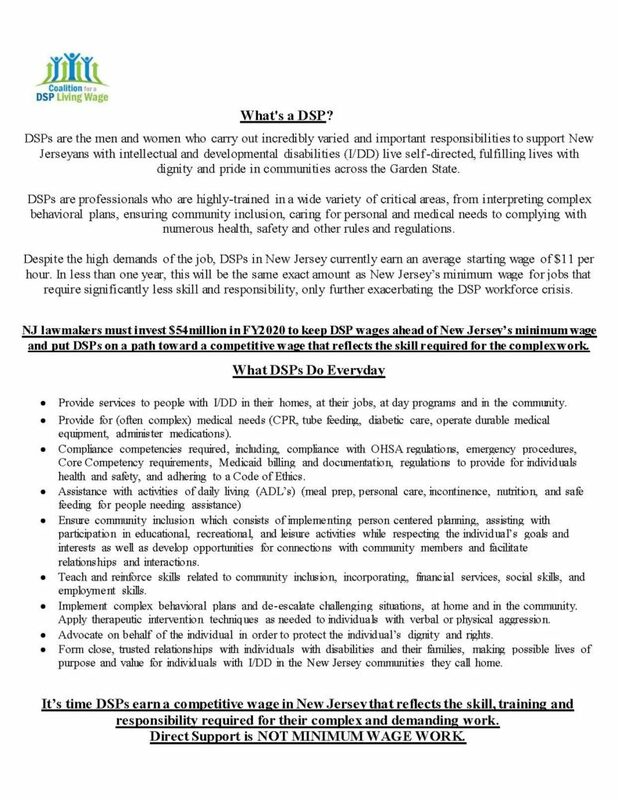 Direct Support Professionals (DSPs) play a vital role in our disability services system, as they provide personal care, social support, and physical assistance to individuals with disabilities in a wide range of activities. They work in a variety of settings including individual and family homes, group homes, supported apartments, schools, workplaces, recreational and fitness settings, etc. DSPs help individuals with I/DD learn independent living skills such as cooking and shopping and make it possible for such individuals to participate in employment and social activities. These dedicated professionals facilitate connections to people, resources, and experiences that foster a full life in the community. DSPs also provide an invaluable service for the families of individuals with I/DD living at home, allowing parents or guardians to take respite time and/or hold full-time jobs. 2. Currently, the need for Direct Support Professionals exceeds the number of such professionals working in the field, and this workforce shortage is only expected to increase. In New Jersey, 48% of direct care worker households rely on some form of public assistance, particularly Medicaid or the Supplemental Nutrition Assistance Program (SNAP). Compensation for DSPs must be increased in order to recruit and retain more workers and to encourage long-term employment. In addition, as more disability services are delivered through individual budgets, resources available for individual budgets must be at levels that allow individuals and families to pay appropriate wages. 3. 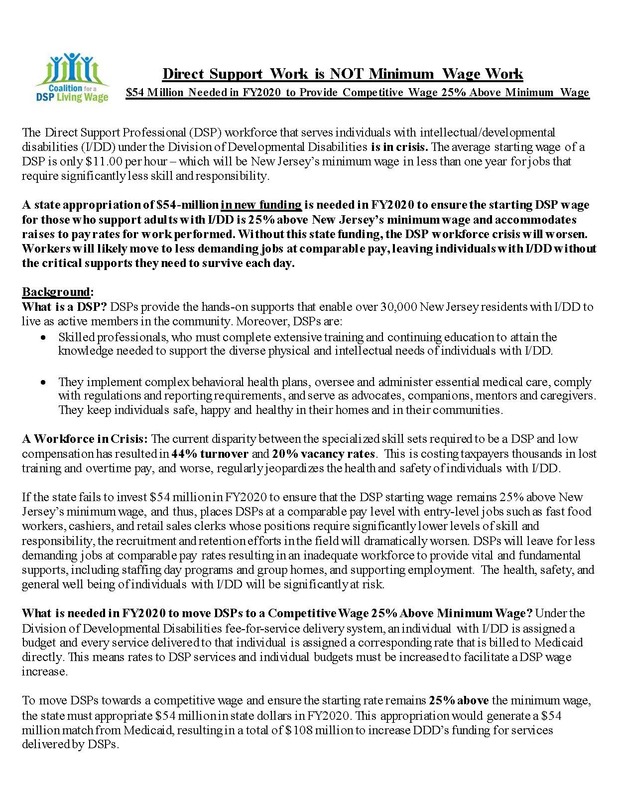 New Jersey must address the workforce issue to ensure service delivery will continue for the individuals with intellectual and developmental disabilities who depend on it. A $1.25 wage increase for all direct support professionals, every year for the next five years, will combat the hiring and retention crisis facing our state. Without an increase, services will be jeopardized. Those who rely on DSPs to live successful lives in the community may no longer receive the assistance they require.